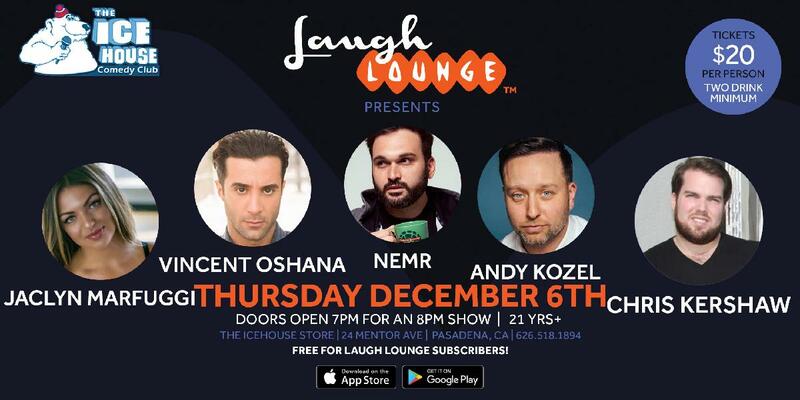 The Ice House :: Laugh Lounge with Nemr, Andy Kozel and more! Laugh Lounge with Nemr, Andy Kozel and more! Featuring 6 great comics - to be streamed nationally! Andy Kozel: Andy Kozel is one of the fastest and hottest rising stars in the LA comedy scene. He began his career in college as a morning radio talk show host for 107.1 The Planet in Champaign, Illinois. At 20 years old, Andy's show became very popular and recieved a #1 in the area ratings beating out syndicated programs such as Bob and Tom and Mancow. After graduating, he trained at the Second City in Chicago and then moved to Los Angeles where he's been tearing up stages ever since. He can be seen regularly at the Laugh Factory and Ha Ha Comedy Club in Hollywood.